With timeless mission style and a sliding door, this server will add function along with a great look in any dining space. The Marbrisa Mission Style Server with Sliding Door by Coaster at Wilcox Furniture in the Corpus Christi, Kingsville, Calallen, Texas area. Product availability may vary. Contact us for the most current availability on this product. Finish & Paint Options Medium Brown finish. Handles & Hardware Dark metal hardware. Case Detail Slatted chair backs, straight legs and edges, mission style. Description: Top Smooth top with straight edge. Case Construction Constructed of select hardwood and veneers. 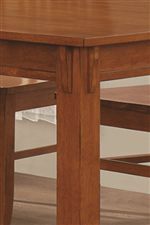 The Marbrisa dining collection features traditional mission style, made of solid hardwood in a warm Medium Brown finish. 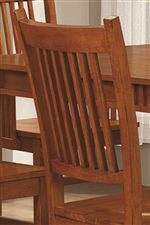 A large rectangular leg table and slat back chairs create the perfect dining set, while the dining room storage pieces feature plenty of versatile storage space. Create a rustic mission style in your home with this wonderful dining room set. The Marbrisa collection is a great option if you are looking for Mission furniture in the Corpus Christi, Kingsville, Calallen, Texas area. Browse other items in the Marbrisa collection from Wilcox Furniture in the Corpus Christi, Kingsville, Calallen, Texas area.